Keith Allan enjoys a break in the French capital - but finds it quieter than usual. Springtime in Paris is just around the corner. But there isn’t much spring in the steps of Parisians at the moment. Even in the so called golden triangle, there is doom and gloom. Top hotels are only 30 per cent full and restaurants all but empty. We are staying at Hotel La Tremoille, a lovely 19th century Haussman building, moments from Avenue Montaigne and the Champs Elysees. The Art Deco lobby has a beautiful sweeping staircase, and during the sixties it became something of a hub for the Paris jazz scene, attracting none other than Duke Ellington and Louis Armstrong. Our well-appointed and extremely comfortable room with its two French windows overlooking Rue Tremoille has Juliet balconies which let you step outside for some air. We are looking forward to our dinner in Le Louis restaurant and bar. We are warmly greeted by an Irish waiter who speaks fluent French. He apologises for welcoming us into an empty room. It’s 8pm and there isn’t a soul in the place. “We are a little on the quiet side,” he tells us with a touch of Irish understatement and a wry smile. For almost the whole evening, we have the dining room to ourselves, and in between courses we talk a little more. He’s a bit fed up. “There seems to be very little going on,” he confides. He’s thinking of leaving the city he loves, but he’s hanging on hoping things will improve. Dinner is very pleasant; pan-fried halibut and a sea bream fillet followed by cheese and coffee and chocolate tiramisu; but it’s strangely lacking in atmosphere only because there is no-one else doing what the French do best - enjoying their food. The next day we are due to return to London, but not before we have visited our favourite cook shop. Dehillerins, in Rue Coquilliere, has drawn chefs and gourmets for nearly 200 years. Dusty, floor to ceiling shelves are packed with coppers big and small, steel pans piled high, knives that cooks can only dream about along with every other kind of utensil to make up the perfect batterie de cuisine. One hour later we emerge with pastry cutters and handsome chef’s knives for our kitchen - and still with plenty of time for lunch. We spot a corner bistro, smart and inviting, and are given a little table by the window and a delicious steak with pomme soufflé and green beans. Their house pinot noir washes it down and we are happy again in Paris. We thank the owner for a delicious meal, and he too tells us that he has never known it so bad. “It’s as though everyone has gone to sleep,” he complains. Time to wake up. Paris is waiting. Buying bottled water is a necessity in most adventurous destinations, but it can often be a hassle - not to mention a waste of plastic. This lightweight, stainless steel personal water filter is a handy solution for travellers, and conveniently removes nearly 100 per cent of bacteria and parasites from water. The two-stage filtration process uses no chemicals or electrical power (meaning no nasty tastes), so you can use it by simply dipping into the water source. And in addition, for each LifeStraw purchased, one school child in rural Kenya will receive safe water for an entire school year. 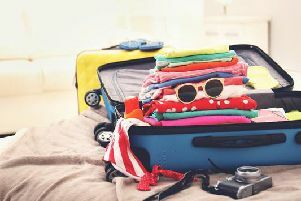 Costs can easily add up on holidays, but according to a survey by travel website Momondo only 50 per cent of Brits budget for their breaks and a fifth don’t even bother at all. The international survey conducted among 29,000 people globally found that the Germans, Swiss and Scandinavians are far more prepared. Nearly half of those Brits who do put away pennies, say they make savings carefully over a long period of time. Others pay for holidays by selling things (10 per cent) while 14 per cent cover costs in instalments. Despite currency warnings of the Pound dropping against the Euro, many families are still planning holidays to Europe this Easter. Research by FairFX suggests more people are travelling this year compared to 2015, with bookings to Spain up by around 10 per cent. Although the pound has also dropped by up to six per cent since January in Norway, Easter holidaymakers can still get 22 per cent more for their pound than two years ago. VIETNAM: On The Go Tours (www.onthegotours.com; 020 7371 1113) offers the seven-night Very Vietnam experience from £1,005pp - saving £394pp (two sharing). Includes accommodation, some meals, activities, guide and an economy class flight from Danang to Saigon. Valid for travel from May 1 - September 30. Deal ends March 31. LISBON: Lastminute.com (0800 083 6000) offers three nights at the four-star Hotel Santa Justa (room only) from £259pp (two sharing). Includes flights from Stansted on April 24. FLORIDA: Virgin Holidays (www.virginholidays.co.uk; 0344 557 3870) offers seven nights at the 4V Disney’s Saratoga Springs Resort & Spa (room only) from £1035pp (two sharing) - saving up to £764pp (42%). Includes car hire and flights from Gatwick to Orlando on May 11. MENORCA: Airtours (www.thomascook.com; 0844 412 5970) offers seven nights at the three-star smartline Marina (self-catering) from £205pp (two sharing) - saving £284 (58%). Includes flights from Stansted on May 13. PALMA: Airtours (www.thomascook.com; 0844 412 5970) offers seven nights at the three-star Protur Floriana (self-catering) from £305pp (two sharing). Includes flights from Doncaster on May 26. COSTA BRAVA: Teletext Holidays (www.teletextholidays.co.uk; 0203 001 0628) offers five nights at the four-star Rosamar and Spa Hotel (all inclusive) from £164pp. Includes flights from Gatwick on May 15. LANZAROTE: On The Beach (www.onthebeach.co.uk; 0871 474 3000) offers seven nights at the three-star Aparthotel Puerto Carmen (self-catering) from £289pp (two sharing). Includes flights from Manchester on March 22. ALICANTE: Opodo (www.opodo.co.uk; 0871 277 0090) offers seven nights at the Hotel Albir Playa (B&B) from £263pp (two sharing). Includes flights from Bristol on April 15. MUNICH: eDreams (www.eDreams.co.uk; 0871 277 0709) offers two nights at the Holiday Inn Munich City Centre (B&B) from £244pp (two sharing). Includes flights from Edinburgh on April 1. GREECE: Simpson Travel (www.simpsontravel.com; 020 8003 6557) offers seven nights at the Blue Infinity villa in Sivota (self-catering) from £682pp (four sharing). Includes car hire and flights from London on May 15.